The National Police Commission (NAPOLCOM) released today, June 7, 2014 the top 20 list of passers for April 27, 2014 PNP Entrance Exam and Promotional (Senior Police Officer, Police Officer, Superintendent and Police Inspector) Examinations. NAPOLCOM said that 2,070 or 16.39% out of the 12,631 examinees passed the Philippine National Police (PNP) Entrance Exam. Out of the 10,673 who took the police officer exam, only 2,084 (26.27%) passed while 1,742 (20.82%) out of the 8,367 examinees hurdled the senior police officer exam. The National Police Commission conducts two sets of police examinations twice a year, one for those who are already in the police service (promotional), and another for those aspiring to enter the Philippine National Police (PNP entrance). 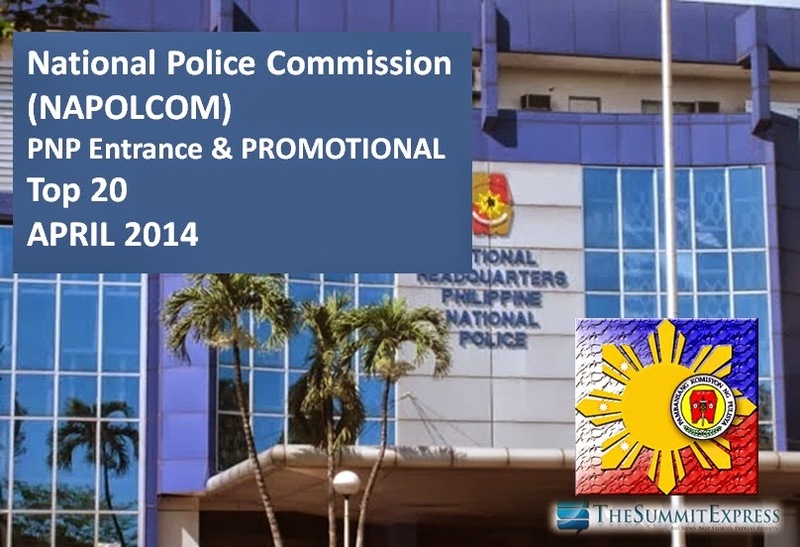 The next NAPOLCOM examination is set on October 2014. The online application scheduling dates will be announced soon. Like Us on Facebook or Follow Us on Twitter to receive news related to NAPOLCOM Examination. Subscribe also on our E-Mail List via Feedburner.